Everyone loves kits - It's got everything you need in one neat package! 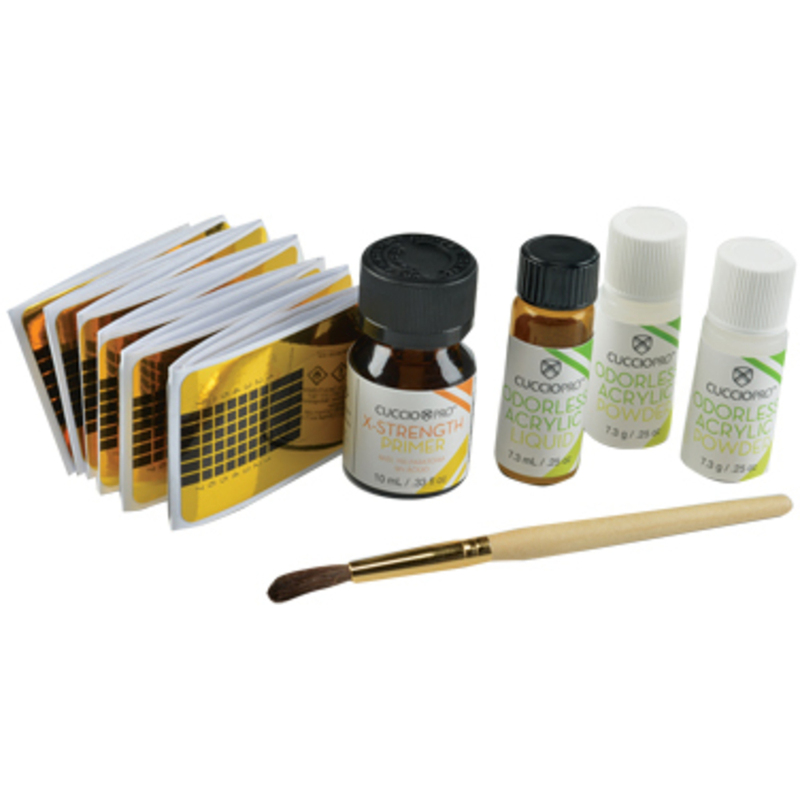 State Board Odorless Acrylic Kits by CUCCIO was a very popular item last week. 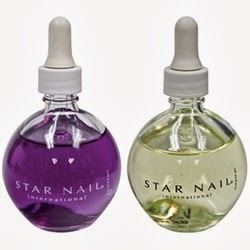 It has everything you need to know how to perform acrylic nail services! There must be lots of new nail technicians taking their licensing tests this month... why? I have no idea... I'm just a shipping guy! See our great State Board Odorless Acrylic Kit by CUCCIO HERE! Are you the owner of a beauty school, or perhaps a teacher? We help beauty schools from all over if you are looking for supplies for your students! We have everything from budget friendly facial beds to kits and more. If you're gearing up to prep your students for their state boards soon, we just got a large supply of State Board Odorless Acrylic Kits by Cuccio! These kits are perfect for your students to learn on, and on top of that, they are completely odorless, so no harsh smells! They include everything they would need - acrylic liquid, powder, a brush, and even a clam shell with insert. We also have portable manicure tables which would be perfect for a classroom setting! If you're a new beauty school or already established, contact us! We could be your once stop source for all of your student's needs. 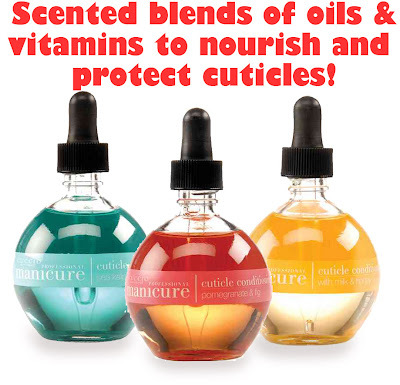 Don't Run Out During Pedicure Season! Summer time is the busiest season for pedicures, and foot treatments! 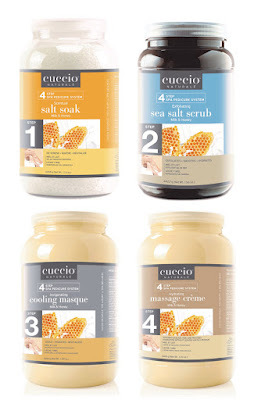 Don't run out of your favorite Milk & Honey Treatment By Cuccio. Soothing milk proteins blended with luxurious organic honey extracts. Softens and nourishes skin and offers a light scent. We bulk priced them for the most economical purchase! Your clients will love how soft, and hydrated their feet feel. Pedi-ready for flipflops & sandals! The health craze from the exotic acai berry has been all the rage in the past few years as health food stores and specialty markets claim it's packed with antioxidants and weight loss properties for ultimate health! Did you know this little berry from the amazon also has a plethora of beauty benefits? From anti-aging to glowing skin, this berry is a perfect ingredient to add to a daily beauty regimen. We have a wide selection of Acai products here at Pure Spa Direct! One of our most popular products is the Acai Berry Hydrophilic Gel Collagen Mask. You can add this facial to your spa menu for your clients who are looking for a new, exotic anti-aging treatment! It's paraben and alcohol free, and abundant in antioxidants straight from the acai berry. Interested in adding new retail products to your spa? We carry an amazing Pomegranate & Acai Body Butter from Cuccio Naturale that I guarantee your clients will fall in love with! Aside from the delicious scent, this body butter promotes healthier and younger looking skin by reducing fine lines and wrinkles. It also contains pomegranate which is another antioxidant filled fruit, making it a highly potent beauty blend! The retail sizes come in an adorable Pop Display making it perfect to put right on the your check out counter. Be sure to view all of our Acai Berry products here! Cuccio recently introduced a revolutionary system for soak off gels and gel polishes called FingerMates. The FingerMates caps are easy to use and take advantage of your client's body heat to speed up removal. The removal pads conform to the shape of the nail & are securely help by the caps, ensuring the acetone is in direct contact with the entire nail & exposure to the skin is minimal. The FingerMates Intro Pack contains 10 FingerMates caps & 20 removal pads. Refill foam removal pads are available in 100 packs. Scentual Pedicures with Cuccio Naturale! Give your clients an amazing pedicure experience with the Scentual Pedicure Salt Soaks by Cuccio Naturale. These salt soaks naturally de-stress, soothe, and revitalize tired, overworked feet. They also offer great detoxifying benfits and leave the skin fresh and clean! 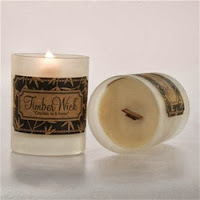 The scents alone will leave your clients in a wonderful state of relaxation that will have them coming back to you over and over! Lactic Acids from milk adds moisture. Honey is a natural humectant to help draw additional hydration. Pomegranate has natural antioxidant properties. Fig provides natural moisture, vitamin C and helps refresh the skin. Kelp helps to soften the skin. Offer your clients even more summer pampering with the new pedicure kits from Cuccio. Summer is sandal season and these kits contain some of the very best pedicure products that Cuccio offers for some luxurious pedicures. They contain a combination of irresistible scents made with beneficial fruit and botanical ingredients that your clients will love! Both kits come with everything you need from start to finish to provide a refreshing and invigorating pedicure service AND they are both under $100! Hydration is KEY for the Upcoming Season!! As the Fall season approaches the weather starts to become chilly and this can cause dryness and roughness of the skin. Keeping skin looking healthy and smooth can sometimes be a challenge but having the best products can help. After all, one of the most precious things on our body is your client's SKIN. So why not take care of it and what better way for your clients to show the importance of taking care of the skin then with these amazing products from Pure Spa Direct! These are just a few of some of the amazing products that can help you keep the skin looking hydrated and healthy. CUCCIO NATURALE, June Jacobs and personal favorite Extended Vacation. 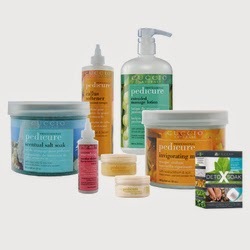 At Pure Spa Direct we have a wide variety of products to hydrate your skin from head to toe!!! Trees changing colors, a chill in the air, pumpkins and apples galore! We may still be in the first week of August, however, it is officially time to start planning and preparing for your Autumn Services. The good news is that the team here at Pure Spa has all of the information you need for unique and a-peel-ing services. In the Spring and Summer months, a simple, yet sublime addition to any manicure, pedicure or hydrotherapy service is the addition of fresh flower petals. During the Fall Season, you can provide a fun and luxurious twist on the classic by sprinkling in Aqua Leaves by Cuccio Naturale. The cost for each 6-Pack is just under $12, so your cost per service is only $2 - $4! 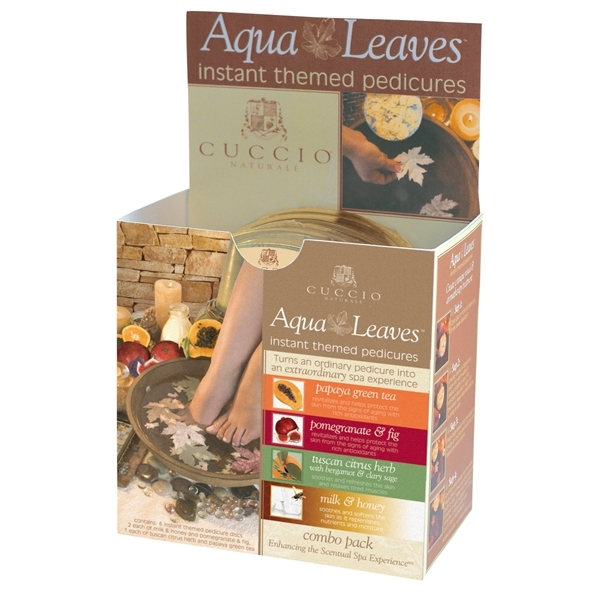 Click HERE to see the Cuccio Naturale Aqua Leaves and Click HERE to see all of the Cuccio products! Transform Your Skin With CUCCIO NATURALE Deep Dermal Transforming Wrap! If you are looking for a great additive to any manicure or pedicure, why not transform your skin with CUCCIO NATURALE Deep Dermal Transforming Wrap! This creamy mask smooths fine lines and wrinkles and promotes skin cell regeneration. It is infused with comfrey root extract and brings moisture deep into the dermis. Upon using this product, you will definitely see the difference. 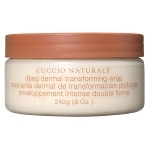 CUCCIO NATURALE Deep Dermal Transforming Wrap is definitely a great product to incorporate with manicures and pedicures. It will make your skin even more radiant! 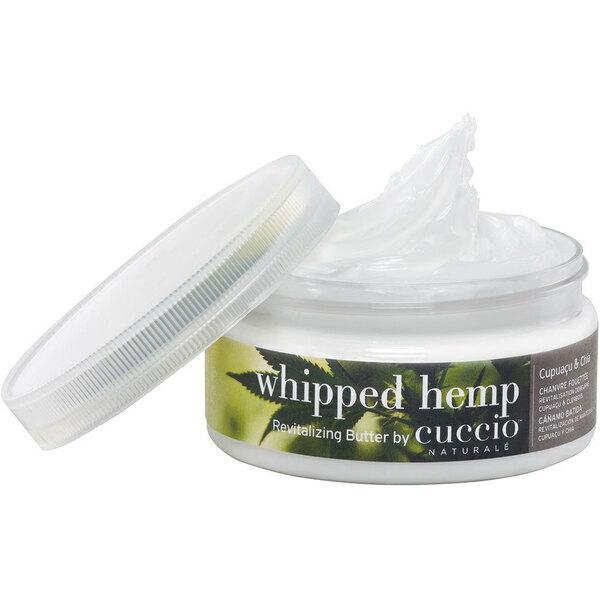 For even more moisture, use with your favorite Cuccio Naturale Body Butter. *Tip: For a more intense treatment, wrap hands an feet with a warm, moist towel and let sit for 5-10 minutes. 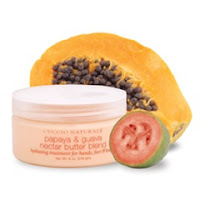 Rinse off and finish up by applying a Cuccio Naturale Body Butter. Your clients will LOVE this!